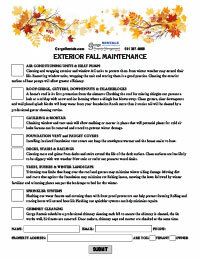 Annual preventative maintenance each fall can have lasting effects in improving the condition of your home. The Gorge Rentals Team is scheduling fall maintenance now. Gorge Rentals Property Management will charge $35/hour for landscape and gutter cleaning jobs. All other Gorge Rentals Maintenance will be $60/hour. The Gorge Rentals Maintenance crew is efficient and will have most supplies on hand. If professionals are hired their charges vary. Charges can be collected from that month’s rent, if available, or charged with a credit card plus a 3% service fee. You may download the forms, below, and fill out the forms using Adobe Acrobat Reader Click on the submit button to send the form to us via email. 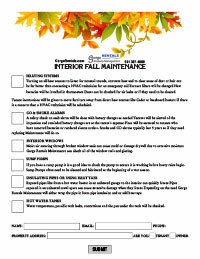 Or call 541-387-4080 to schedule fall maintenance for your property.